Josh Brown|Troy Daily News Miami East’s Brenden Dalton (68) brings down a Fort Loramie ballcarrier Friday. Josh Brown|Troy Daily News Miami East’s quarterback Ian Gengler is tracked down a Fort Loramie defender Friday. Josh Brown|Troy Daily News Miami East’s Justin Brown is held up by a pair of Fort Loramie defenders Friday. 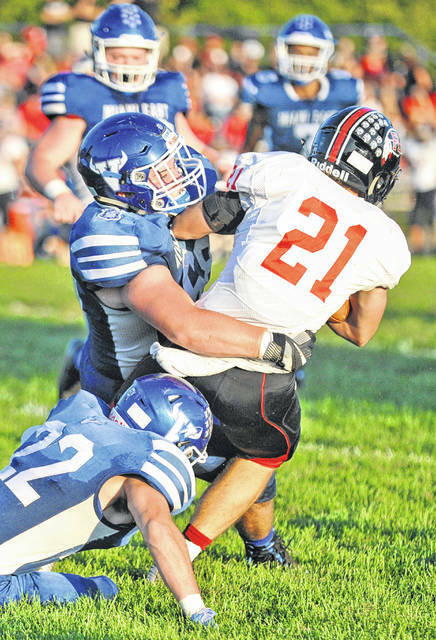 Josh Brown|Troy Daily News Miami East’s Justin Brown can’t get around the edge of the Fort Loramie defense Friday. Josh Brown|Troy Daily News Miami East’s Kaleb Nickels defends as Fort Loramie’s Mark Seger goes for a ball in the air Friday. Josh Brown|Troy Daily News Miami East’s Kaleb Nickels wraps up a Fort Loramie receiver as teammate Colt Frazier (11) trails the play Friday. 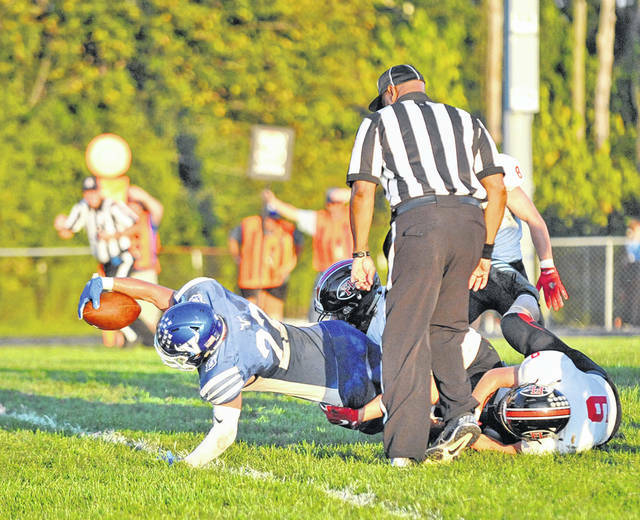 Josh Brown|Troy Daily News Miami East’s Vincent Villella stretches across the goal line on a first-quarter touchdown run Friday against Fort Loramie. Josh Brown|Troy Daily News Miami East’s Vincent Villella breaks through the middle of the line Friday against Fort Loramie. 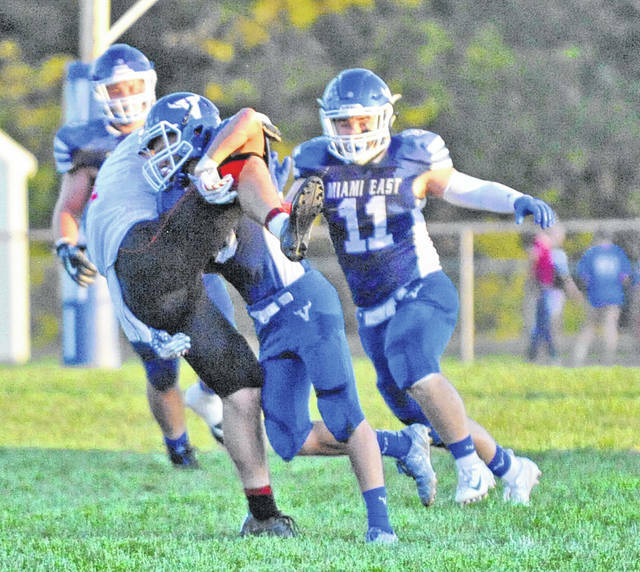 CASSTOWN — After winning a one-point war at league newcomer Fort Loramie last season during a 9-1 regular season run and an unbeaten march to a Cross County Conference championship, Miami East knew what it was in for Friday night. The Vikings just couldn’t get anything going. 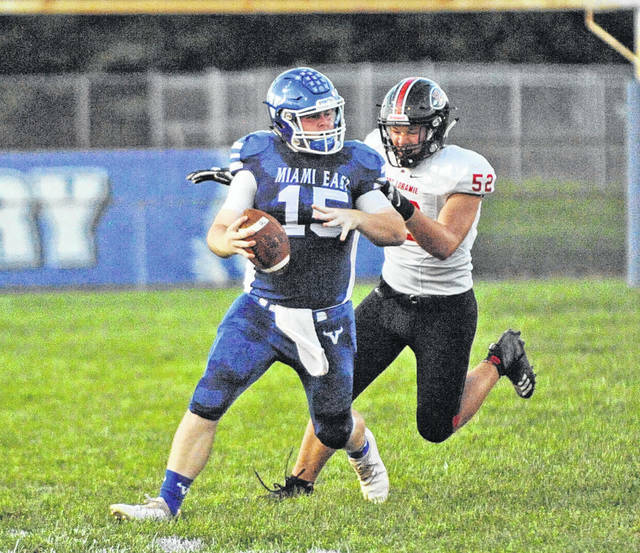 After a methodical march down the field on its first possession of the game, the Miami East offense stalled on every other drive in the game, unable to break through against the punishing Redskin defense. And on the other side of the ball, Fort Loramie quarterback Collin Moore used a handful of lengthy hookups through the air to help the Redskins put up a two-touchdown victory over the Vikings, 21-7 Friday night at Miami East High School. With a win over Covington — the other perennial CCC champion — in the books last week and last year’s runner-up Bethel not on its schedule, Friday’s win puts Fort Loramie (3-1, 2-0 CCC) firmly in the driver’s seat in the league standings. Defending league champion Miami East — which had defeated its first three opponents by an average score of 45.7-11.3 — falls to 3-1 and 1-1 in the CCC with the loss. Miami East began the game strong, though. After the Redskins were able to convert a third-and-13 on the game’s opening possession, the Viking defense forced a stop at midfield and took over on its own 24. The Vikings then went on a 12-play, 74-yard drive — one that included a clutch third-and-6 conversion on an 8-yard pass from Ian Gengler to Kaleb Nickels — with Vincent Villella finishing it off with an 8-yard touchdown run up the middle on third-and-2 to give East a 7-0 lead with 4:22 remaining in the first quarter. Fort Loramie had the answer, though, as Moore hit Mark Seger with a 44-yard bomb on the second play of the ensuing drive to put the ball on the Viking 11. Three plays later, Moore threw the first of his two touchdown passes on the night, hitting Mason Kemper on a short 10-yard slant over the middle to tie the score at 7-7 with 1:47 left in the opening quarter. The Vikings were forced to punt at midfield on the next possession, and then it was the Redskins’ turn to drive the ball down the field. Eventually, fullback Max Hoying capped off a 14-play, 80-yard drive with a 2-yard plunge up the middle, and Fort Loramie held a 14-7 lead with 4:54 until halftime. After a Viking three-and-out, a 33-yard pass from Moore to Seger set the Redskins up at the Viking 16 with less than two minutes remaining, but a 27-yard field goal attempt was off the mark, and the Vikings went into the locker room only down by seven. The second half wasn’t more kind to either offense, as both teams failed to score in the third quarter. Miami East had a shot on its first possession, but Seger cut a lengthy drive short by making a diving interception on a tipped ball. And early in the fourth, Moore hit Seger with a 9-yard touchdown pass to give Fort Loramie a little breathing room, putting the Redskins up 21-7 with 9:30 to play. 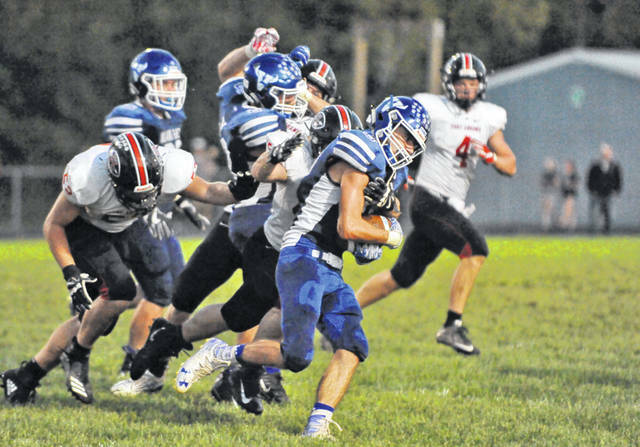 With 6:48 to go, Miami East had one last chance to get back into the game but couldn’t convert on fourth-and-6, and Fort Loramie was able to hold off the Vikings from there. For the game, Villella had 80 yards on 15 carries and Justin Brown — who was averaging more than 10 yards a carry coming into the night — was held to 43 yards on 11 carries. Gengler was 3 for 7 passing for 15 yards, eight of those yards to Nickels and seven to Villella. Moore finished the game 13 for 18 passing for 212 yards and two touchdowns, and Hoying added 97 rushing yards and a score on 18 carries. Miami East will remain at home in Week 5 but has a quick turnaround, facing Bethel on Thursday night. Fort Loramie, meanwhile, will return home to take on Ansonia. https://www.dailycall.com/wp-content/uploads/sites/30/2018/09/web1_091418jb_me_brendendalton.jpgJosh Brown|Troy Daily News Miami East’s Brenden Dalton (68) brings down a Fort Loramie ballcarrier Friday. https://www.dailycall.com/wp-content/uploads/sites/30/2018/09/web1_091418jb_me_gengler_fl_52.jpgJosh Brown|Troy Daily News Miami East’s quarterback Ian Gengler is tracked down a Fort Loramie defender Friday. 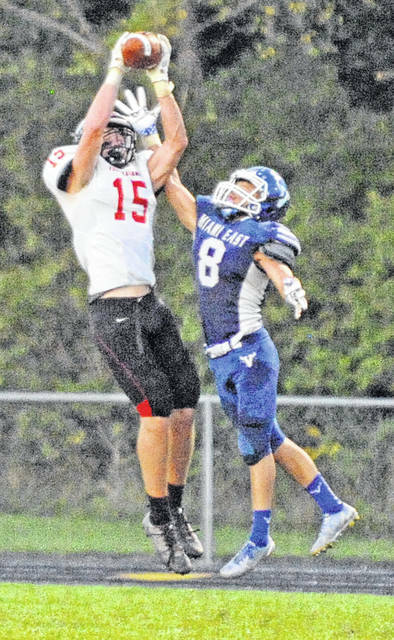 https://www.dailycall.com/wp-content/uploads/sites/30/2018/09/web1_091418jb_me_justinbrown.jpgJosh Brown|Troy Daily News Miami East’s Justin Brown is held up by a pair of Fort Loramie defenders Friday. 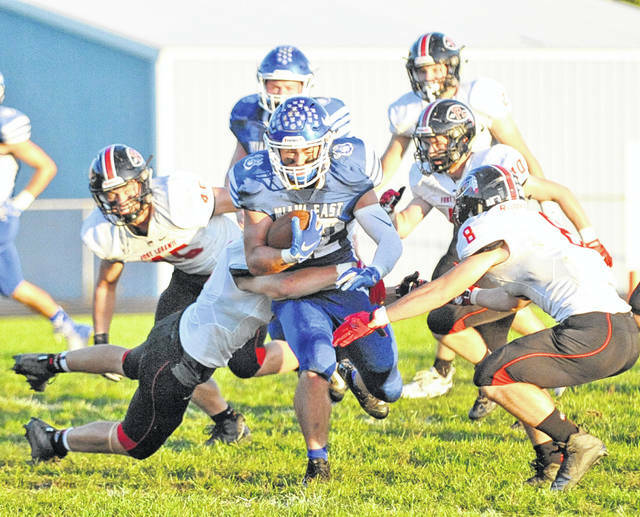 https://www.dailycall.com/wp-content/uploads/sites/30/2018/09/web1_091418jb_me_justinbrown2.jpgJosh Brown|Troy Daily News Miami East’s Justin Brown can’t get around the edge of the Fort Loramie defense Friday. https://www.dailycall.com/wp-content/uploads/sites/30/2018/09/web1_091418jb_me_nickels_FL_15.jpgJosh Brown|Troy Daily News Miami East’s Kaleb Nickels defends as Fort Loramie’s Mark Seger goes for a ball in the air Friday. 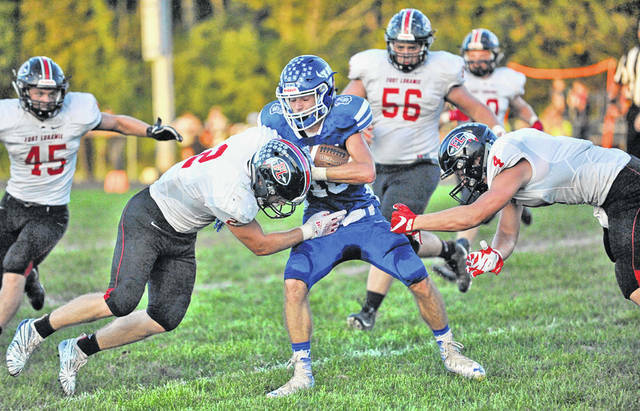 https://www.dailycall.com/wp-content/uploads/sites/30/2018/09/web1_091418jb_me_nickels_frazier.jpgJosh Brown|Troy Daily News Miami East’s Kaleb Nickels wraps up a Fort Loramie receiver as teammate Colt Frazier (11) trails the play Friday. https://www.dailycall.com/wp-content/uploads/sites/30/2018/09/web1_091418jb_me_villellaTD.jpgJosh Brown|Troy Daily News Miami East’s Vincent Villella stretches across the goal line on a first-quarter touchdown run Friday against Fort Loramie. https://www.dailycall.com/wp-content/uploads/sites/30/2018/09/web1_091418jb_me_vincentvillella.jpgJosh Brown|Troy Daily News Miami East’s Vincent Villella breaks through the middle of the line Friday against Fort Loramie.